Yesterday (May 8) marks the one year anniversary of the day we got “the call”. The call that confirmed our unborn baby has Down syndrome. Our Down syndrome day. The day our lives were forever changed. One year ago we thought it was the worst day of our lives – the ending of our life as we knew it. Truth be told, it was just the beginning. The beginning of actually living life. A second chance to appreciate the world and all that is in it. My eyes were opened (and looking quite scared I’m sure) that day in May. My heart was opened October 25 when our little boy was born. Oh we are so blessed. So, so blessed. Please note, our lives are not perfect. Not even close. Although I try to remain upbeat and positive in this blog, we struggle just as any family does. But, our challenges are not because Eli has Down syndrome. We have more bills than we have money. Our car is in the shop. Our toddler decided to throw an embarrassing tantrum in the middle of the waiting room at the doctor’s office. I’m sure those “problems” are probably similar to half the population. It’s called life. We went to the beach this past weekend. The same beach that we went to last year that helped cleanse our souls and pointed us in the direction towards acceptance. To read about that trip (and the sad, overwhelming few weeks leading up to it) check out my very first blog post – ACCEPTANCE. This trip, I spent a lot of time reflecting. I thought about the scared woman who cried so many tears after receiving that phone call. The husband who physically and emotionally checked out for a week. The friends and family members who offered their condolences. The baby that was growing inside me, completely unaware that we were all so devastated. It seems like a lifetime ago. Yet I remember it like it was yesterday. If I only knew then what I know now, I wouldn’t have wasted so much time grieving. I should have been celebrating. Rejoicing in the blessing that was being bestowed upon us. We are good enough parents to “handle” this. We can do more than we ever expected (and do it well!). I would be fortunate enough to meet a whole group of new friends, some who have become like a sister to me (and reconnect with many old friends throughout this whole process!). I will find strength in myself that I never knew existed. But, that strength will never compare to the strength I see from my child. Cody will be ok – even through four hospital stays, a host of health issues, doctor visits, and therapy all for his brother. He still goes to bed each night telling me he loves me and that I am his best friend. Eli will do things at an “age appropriate” level. And when he does fall behind on occasion, it is not the end of the world. (By the way – He rolled over for the first time this past weekend. He sat unassisted for the first time today!!!). Dreaming about his future is ok. He will have a future. Super heroes are real. My son proves it. I will love this child with every fiber of my being. I love him just as much as his brother (I really was once afraid I wouldn’t love him as much!). I will eventually forgive myself for the feelings I once had. I took a bunch of pictures at the beach. Some of Cody, some of Eli. When Cody’s shadow joined him in a picture, there was only one. (I am referencing an amazing picture I posted in ACCEPTANCE). That shadow joined him in the flesh this time. I am still certain that extra shadow was his brother. One year later I can tell you life certainly is ok. It is more than ok! Through our challenges and subsequent triumphs we, as a family, have made it through stronger, tougher, and more appreciative. Life is different. It is actually better than I could have ever imagined. If only we did know! I think all the emotions were necessary to get to where we are today. Yay for rolling and sitting! Go Eli! The emotions and feelings I experienced at the beginning have made me appreciate today, and tomorrow, so much more! Even though I found out about my Baxter after he was born, those emotions are so raw. I agree, if I only knew then what I know now. I’m so glad to have ‘met’ you on this journey! And way to go Eli rolling and sitting! Absolutely beautiful post! And congrats on your little guy’s milestones–that is fun! Congratulations on your pregnancy! I’m glad you found my blog. I’m sure your emotions are varying minute by minute. It is quite the roller coaster ride. Please know, whatever you may be feeling is ok and normal. I’m not sure if you read any of my other posts but I started this blog a couple of months after receiving our diagnosis. The very first post shows just how vulnerable, scared, and desperate we were feeling. The journey to our son’s birth was hard, I won’t lie, but if I look back on the pregnancy now I have one regret – I wish I didn’t spend so much time worrying. Please try and enjoy the pregnancy. 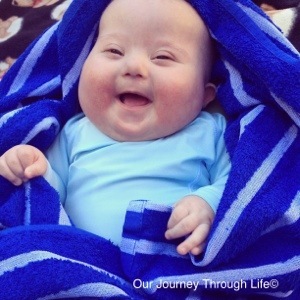 You are still having a baby – he or she just happens to have an extra chromosome. If you need support in any way, please feel free to email me at melanie_harrington@hotmail.com or message me through this blog. The “club” you are joining may not be what you had in mind at first but you are about to embark on an amazing journey – and you’ll meet some pretty fabulous people along the way! Awesome blog! I have a similar story with my little one too!! Please read my blog and share with friends–I am not as good as writing on a timely manner as you are—but I did share about my anniversary so to say. I can remember that day in February like it was yesterday. The same emotions run through my mind–and I kick myself everyday thinking I did waste so much time. However, I do believe the time I spent thinking and “grieving” has mad me the woman I am today!! Love your sharing!! I most definitely believe grieving is an integral part of the process. Yes, I wish I grieved less but like you said, it helped me get to where I am today. Thank you for sharing your story! duh–http://aturnintheroad.blogspot.com/ I guess you need this!! Wow, what a great blog. Am sitting here in Australia with tears streaming down my face after reading this post and also acceptance. I am the mother of an 18 year old girl with DS. She is our eldest and we didnt know until her birth of her DS. I was 24 when I conceived her, so much of my story is different to yours, but the love we feel for our children is just the same. Tyler is such a joy. She is the most beautiful, sweetest natured child. Like you I worried about her future, what would she miss out on? But she plays netball, she did her debutante ball, she has a boyfriend, she was school captain at her school last year.She is so tech savvy its crazy. She has set up her own twitter account and tweeted Ashton Kutcher, without any help. She is on facebook, twitter and instagram. She knows more about the bands she loves than anyone should! Now shes working at a catering company and doing so well. We are so proud of the beautiful young lady she has become. She has a younger brother and sister who adore her also. Having a child with DS brings with it a kind of ongoing grief. There is always something coming up that we have to deal with because of the Down Syndrome but the positives it brings are far greater. She is happy, she is happy with who she is and so happy with her life. Thats all any parent wants for their child. Hi Georga! 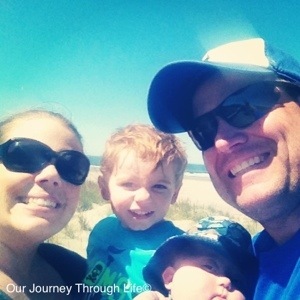 Thank you for sharing your story of your sweet girl. It is wonderful to hear from this that have started on this journey before us. It’s nice to hear how “normal” life is. I will admit – the future is something I tend to stay away from in my thoughts. It really overwhelmed me in the beginning. Now, I’ve just come to realize, staying in the present is a blessing. It has helped me to appreciate every day and not stress (too much) on the numerous questions I have for the future. Thank you again for telling me your story. These connections are some of the things I cherish most about sharing our journey. Cheers! Yes! Yes! Yes! I’m going to share this with many! Bethany is 12 now and I still thank God every day for the giving us the perfect gift we never knew we needed! blessings to your little Eli and your whole family! Thank you for your kind words. I too often refer to this journey as one I never knew I wanted to go on but am so happy we are! Blessings to you and Bethany. An inspiring post . A special needs child needs special parents like you. Well put! I had a birth diagnosis (7.5 yrs ago!) but when I look back at it my only regret is that I lost the first couple weeks of my baby’s life worrying and crying. I wish I had seen a blog like this back then so I would have known it was not the end of the world but the beginning of an even brighter future. Thank you Lisa! I am so thankful to have received a prenatal diagnosis as our grieving was done prior to his arrival. Seems so silly to have grieved – but I had no idea what a blessing I was being given! So lovely and worth sharing. So, I will. Thank you for posting this in such a true and lovely voice. Thank you Mardra! I appreciate you sharing! Thank you so much for this post! I have been struggling since our prenatal diagnosis about a month ago and this post just spoke to me…no…screamed at me. It’s amazing how you pretty much captured my emotions and put them in words. I am praying that I am able to hurry up and heal and go back to loving pregnancy until my little boy arrives in December. I am glad my post touched you. The prenatal journey is hard, very hard. Give yourself time – you will get through it. My baby boy (10 1/2 months old now) has brought more joy to my life than I could have ever imagined. He truly is the light in our family. I often say how we are the lucky ones – and it is so true. Hang in there mama. If you ever want to talk I am available any time. I am happy to send you my email or cell phone number.